It’s a beautiful watch at a great price. I bought it for my nephew’s 21st birthday and he was in awe of the watch, especially since he’s a boater! Casio always steps up to the plate when it comes to making quality, versatile watches. 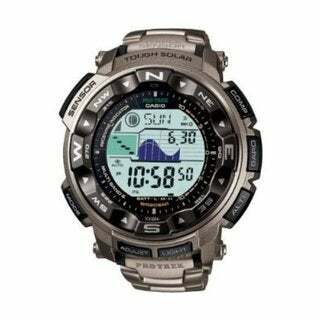 This digital timepiece showcases a black digital dial and features a compass, altitude, barometer, thermometer, tide graph, timer, a stopwatch and moon details. Fantastic watch. I was leery at first because the two pictures of it on the Overstock website looked SO different, however, it truly is a light gray (titanium) wristband as is the majority of the watch case itself. It is rugged as all get out and looks good doing it. I've owned one of its predecessors for many years (PAG240) and still love and wear it. The old one is more of an outdoors roughing it type of watch. I'm sure this new one would perform just as well but, why risk marring the finish? Just so you know, the right image is the one that looks closest to what you get. I think the lighting in the left image was poor. Nothing to do with the watch. LOVE MY NEW WATCH. Cool nerd alert! This watch has all the bells and whistles you need for the avid hunter, fisher or sportsman in your life. There’s a reason these low-key but high-performing watches are a cult favorite with sportmen all over. They take a beating and still look great for work and play. Great value for the style and functionality. Love the watch! Titanium band color took some getting use too but it does everything I wanted.